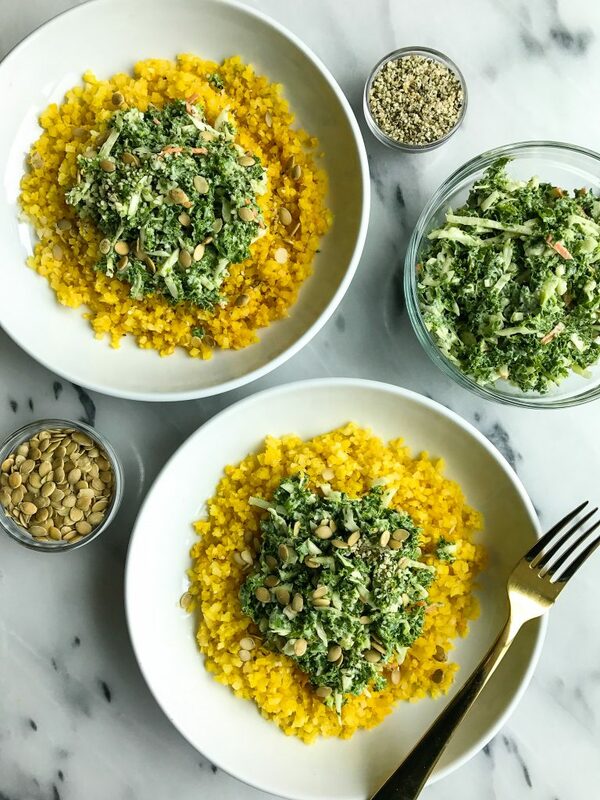 Turmeric Cauliflower Rice Bowl with Crunchy Green Slaw for an easy grain-free meal! 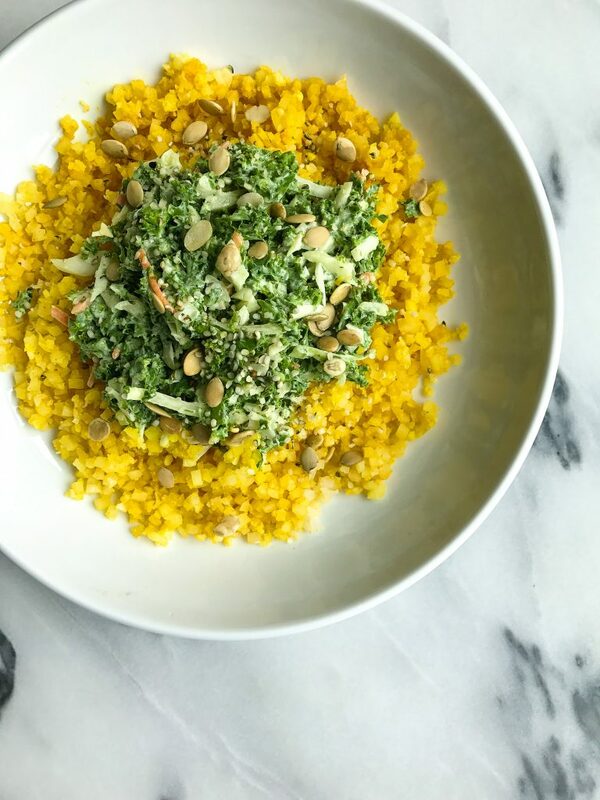 Turmeric Cauliflower Rice Bowl with Crunchy Green Slaw, hot DAYUM! When I made turmeric cauliflower rice at home, I craved something crunchy and cool on top. I’m not a huge cole slaw person but ever since I tried Sir Kensington’s Fabanaise, I am obsessed. It is the first and only vegan mayo made with aquafaba and no eggs. In case you’re wondering “what the beep is aquafaba?”, when chickpeas are cooked in water, they release starches and proteins that bind to make a perfect replacement for the eggs normally used to make mayo. It is such a crazy creative way to use something that normally just goes to waste. Sir Kensington’s is pretty much genius to turn this into a mayo. They have two flavors of Fabanaise: Classic and Chipotle and they are both soy-free, non-GMO and vegan. 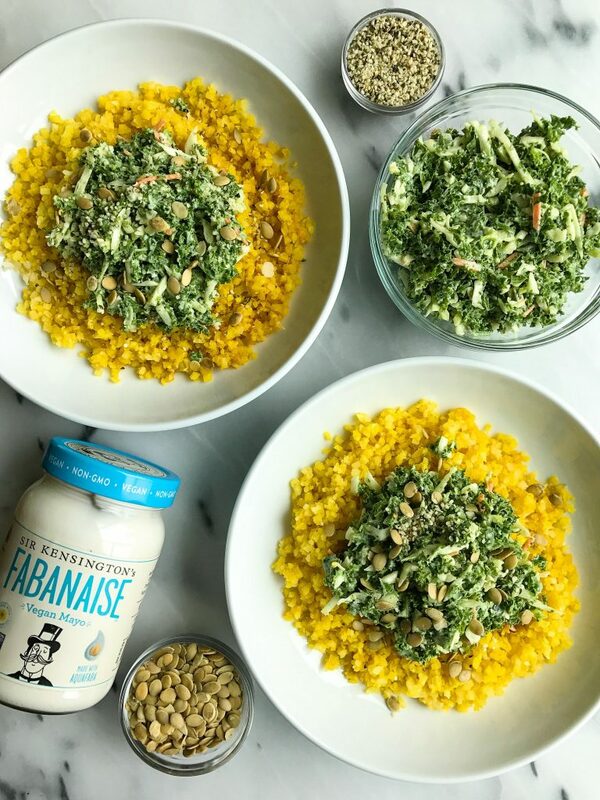 I combine it with olive oil, kale, cabbage and some apple cider vinegar for a perfect savory crunchy green slaw to top your cauliflower rice with. You can also add your favorite protein or even some chickpeas on top of this recipe for a little extra somethin’. I recommend making this slaw in advanced and eating it the next day so they flavors really marinate. Once ready, add Crunchy Green Slaw on top and enjoy! You can also add chicken or your favorite protein, avocado, seeds, etc! Thank you Sir Kensington’s for sponsoring this post. It means so much to me to work with brands that I love and who support rachLmansfield! I have been all about incorporating turmeric into my cooking lately as well. I love the health benefits, especially the gastrointestinal benefits! Can’t wait to try this! That tangy slaw sounds delicious!! I absolutely LOVE the color of this cauli-rice too. I like buying purple or yellow cauliflower heads from Whole Foods because their color is just so darn gorgeous, but this way I can fake it if I can’t get to Whole Foods. Thanks for sharing this 🙂 ! This looks amazing! One of my favorite meal bases is curry cauli rice! SO good! I couldn’t find that vegan mayo, so I subbed it for avocado!! I love the combo! I’ve made this recipe a few times now and I’m so obsessed. Thanks, Rachel!